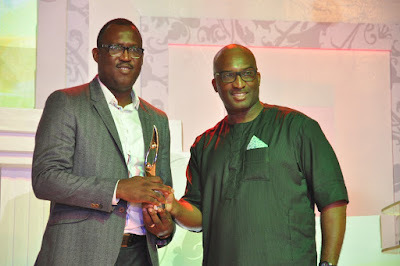 L-R, Chief Sales Officer, Airtel Nigeria, Godfrey Efeurhobo while receiving the SERAs Award for ‘Best Company in Health Intervention’ from the MD/CEO, Film House Cinemas, Kene Mkparu at the SERAs Awards 2015 event in Lagos on Friday. For its Corporate Social Responsibility (CSR) programmes which have enhanced the country’s healthcare system, Airtel Nigeria has been adjudged the ‘Best Company in Health Intervention’ by SERAs (Social Enterprise Report Awards) at its 2015 Awards ceremony. Themed ‘Building Partnership for a Sustainable Future,’ the 2015 SERAs Awards which is the 9th Edition, held at the Muson Centre, Onikan Lagos, with notables personalities in attendance.